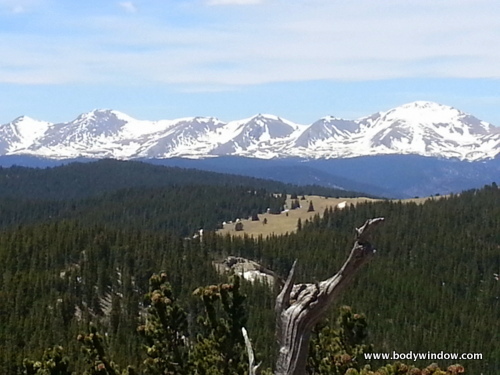 The views of the West Spanish Peak along the Apishapa Trail made for an awesome day in the Colorado Mountains. If you are planning a trip to Southern Colorado, I would highly recommend this trail, less heavily used than the West Spanish Peak Trail, with which it eventually connects. Summer hiking season came late to Colorado this year, in 2013. I was really getting antsy waiting for the cool weather and late snow to dissipate. 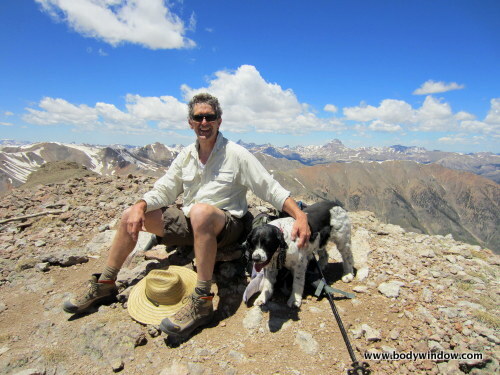 On Memorial Day weekend, my husband, Rich, my dog Avie and I were supposed to be climbing a centennial thirteener in Colorado. 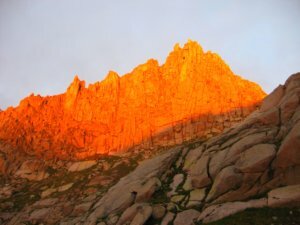 We had only 4 left to complete the "centennials," the top 100 peaks in Colorado, all above 13,800 feet. Every year on this holiday, I get restless. It is always difficult for me to wait for the climbing season. 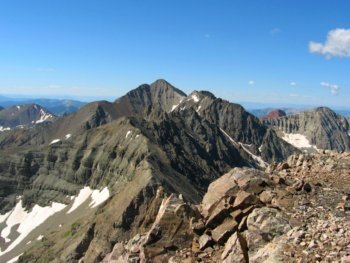 Since the worry over any snow conditions kept us from climbing a high centennial peak, we decided instead to try the Apishapa Trail, on the south side of the West Spanish Peak, near Cuchara in Southern Colorado. Apishapa (pronounced uh-PISH-uh-puh) is the name for a Native American Plains Indian tribe.The word itself means "stagnant" or "stinking water" which may be the name given to a river by the Ute Indians. To get to the Apishapa Trailhead take Colorado State Highway 12 to the top of Cuchara Pass, from either Trinidad (southern approach) or from La Veta, (northern approach). You will see a sign for the Cordova pass road, County Road 46. Turn East here, toward Cordova pass. Go approximately 10 miles, up and over Cordova pass, past the day use area and the West Peak Trailhead, to the marked Trailhead. If you have a car shuttle option, you can take the Apishapa Trail to where it meets the West Peak Trail, hike out the West Peak Trail and be picked up at the trailhead on top of Cordova Pass. 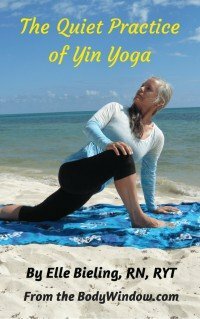 This would cut off several miles from your hiking trip and would save you the required fee at the day use area. We did the trail out and back, for a 7 mile, moderately strenuous hike. The elevations stays within 9800 to about 11,000 feet, so if you are not accustomed to the elevation, go slow and drink plenty of water. I always like to take 2 aspirin as well, as a blood thinner, to aid in your circulation and oxygenation. Do not take aspirin if you have any stomach conditions. If you do take it, eat some food with it and use the enteric-coated version, so it won't harm your stomach. Both the Apishapa Trail and the Wahatoya Trail share the same trailhead. Just below the Apishapa Trailhead, there is a parking lot along side the road. when looking for the parking lot, as you are driving East, drive past this trailhead sign and it will be on your right, shortly. 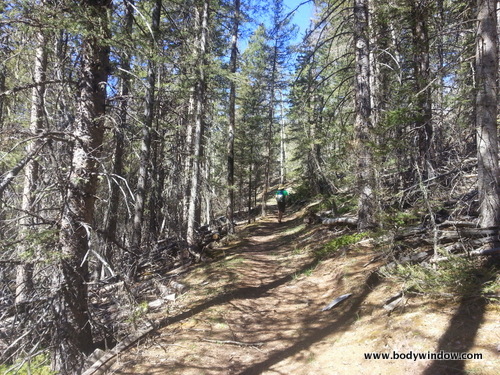 The trail steadily climbs up switchbacks, through the thick pine forest. You can see lots of dead-looking trees from the beetle kill, which fuels the wildfires in a dry year. 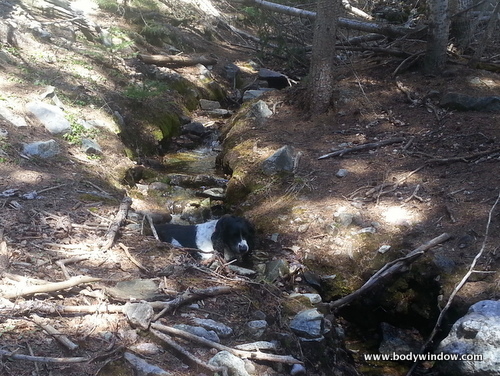 The trail follows a creek for a ways, and my dog, Avie, would often take a detour to cool down. The Apishapa Trail eventually meets the Wahatoya Trail, after about one and a half miles. 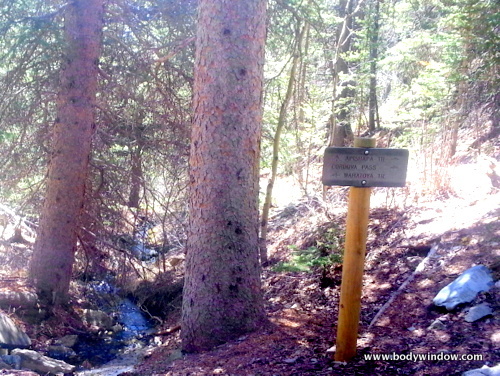 The convergence of trails is well marked at a stream crossing. Stay left to continue on. 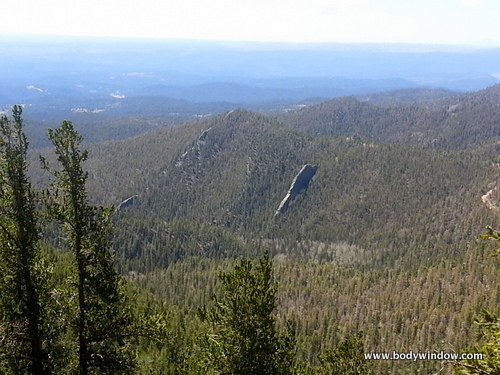 As you climb higher on the trail, switch-backing the side of the mountain, interesting geological formations are seen. These rock walls are know as dikes. Many years ago, both the West Spanish Peak and the East Spanish peak were volcanoes. When the lava was spewed out from the volcanoes, it ran into cracks in the earth. Over many, many years, the earth eroded, leaving the dikes. As you climb closer to tree-line, the vistas open up to the south, west and north. Here you see the rows of dikes, and how they were formed through erosion. 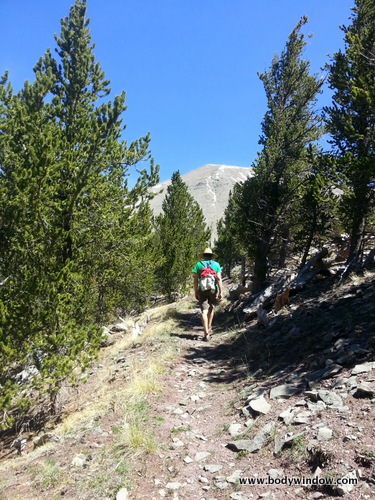 Climbing still higher, you catch glimpses of the West Spanish Peak in all its glory! The peak looms ahead for most of the remainder of the trail now. 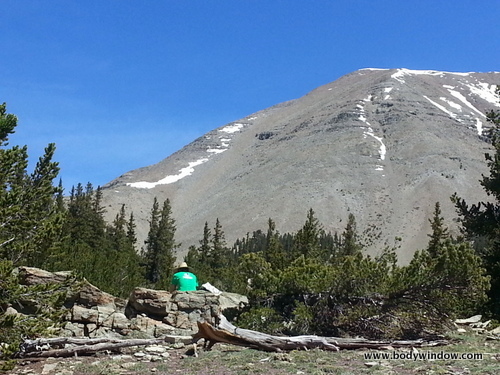 We stopped for lunch here on this rock wall, below the West Spanish Peak. If you go no further, it would have been worth the trip! From this spot, the trail is difficult to see, but it trends to the left, heading lower into the trees. After another two miles, the Apishapa Trail meets the West Peak Trail. 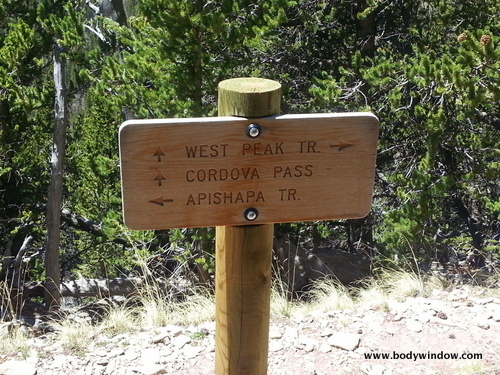 If you turned left and headed down the mountain, it would end at Cordova Pass and the start of the West Peak Trail. This would make a lovely trip if you had a car to shuttle you back to where you started. 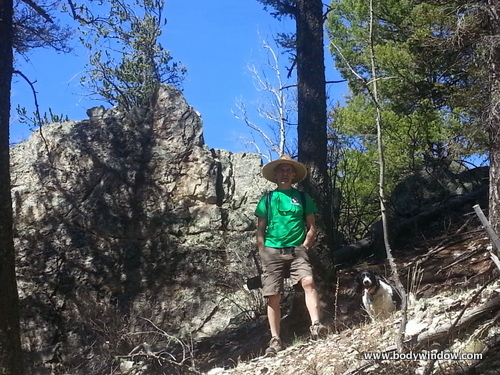 My husband and I opted to turn right, and continue on up the West Peak Trail, climbing a bit higher. This trail eventually summits the peak, but we had done that several times already. 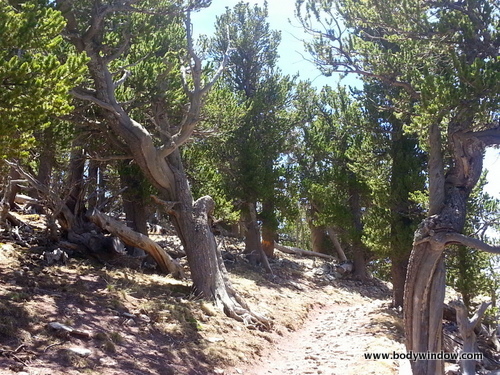 On this day we chose to go on about a mile to see the amazing bristlecone pine forest. These gnarly trees look like something from the Hobbit. 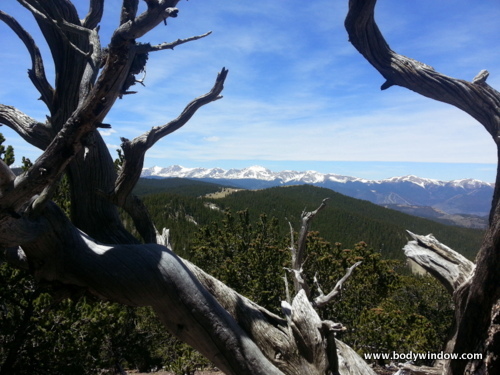 In the midst of the bristlecone forest, expansive views of the Sangre de Cristo Mountain range to the West, open up. Here are some of my better shots. 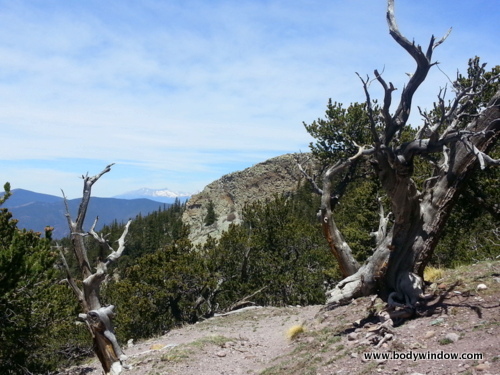 We hung out here among the Bristlecones, in an area where we could enjoy the view. We enjoyed about one hour of bliss, for all of our hard work to reach this glorious spot on this warm spring day! I hope you enjoyed our journey into the Colorado mountains. 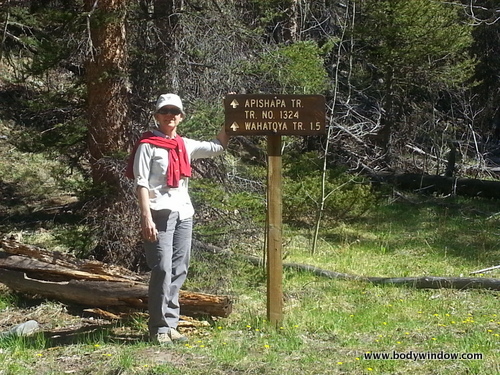 The next time you come to southern Colorado, try the Apishapa Trail. You will most likely have this side of the mountain all to yourself! It is worth the strenuous effort. Being out in the Great Outdoors always heals my body-mind-soul!